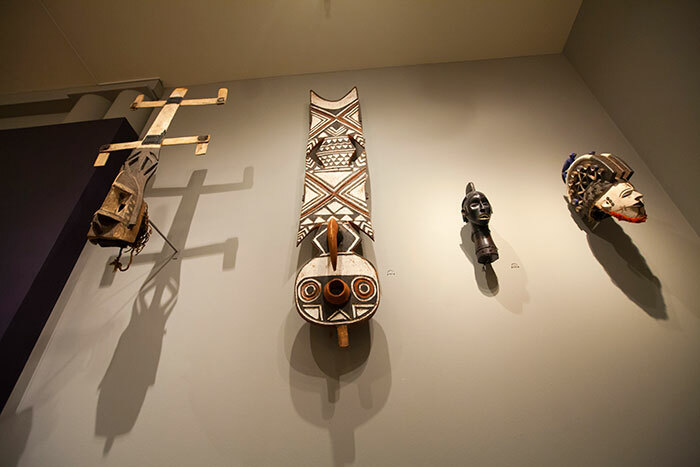 African art curator Amanda Hellman hopes the newly redesigned African galleries will encourage students and professors to curate a section of objects and get them thinking about this continent through different lenses. “We have a really valuable asset at Emory with a great African studies program. 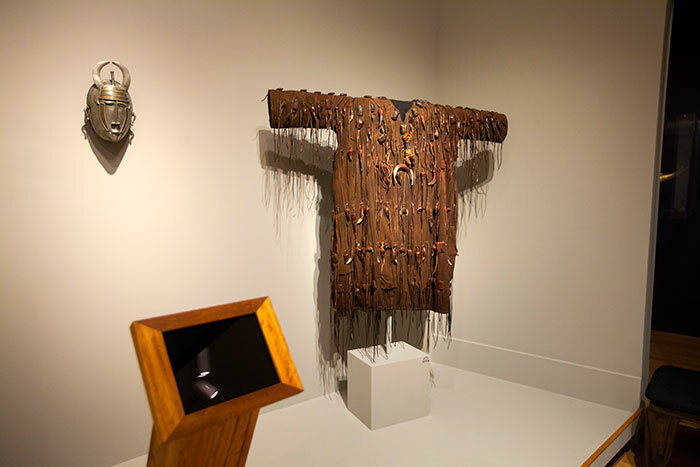 Thinking about it through this visual lens, we can pull items out of storage so we can conceptualize them differently and think about the continent differently,” she says. For example, Hellman has worked with Susan Gagliardi, assistant professor of art history, helping find objects that fit the theme and structure of Gagliardi’s classes. “I try to point them in the direction of newer pieces so research can be done on them,” Hellman says. The museum is an ideal resource for Emory's emphasis on teaching students to work with and understand primary evidence, she notes. The Omeka content management system allows students, professors and museum staff to curate online exhibits and makes the museum's collections more accessible, she notes. Over 1,000 high resolution images of works of art in the Carlos Museum's collections are available online and can be accessed with an Emory user ID and password. 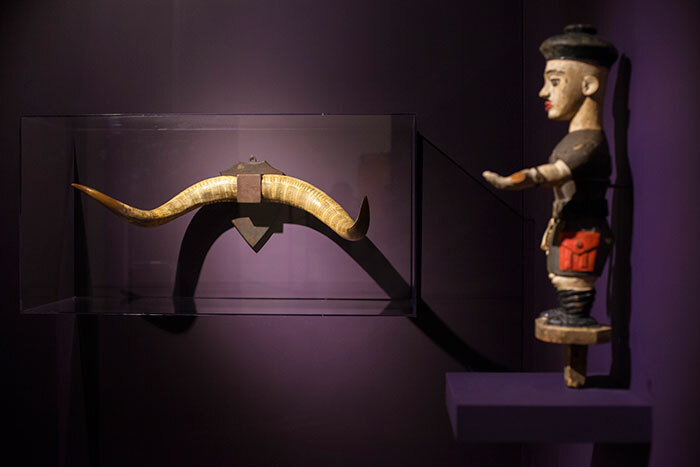 A pair of rare southern African cattle horns carved with scenes from a historic colonial war, a beaded bowl figure used by Cameroon royalty to hold kola nuts for their guests, and the Nigerian shrine figure Mami Wata who giveth or taketh away, depending on her mood, are among the objects on display in the Michael C. Carlos Museum’s newly redesigned African galleries. The museum reopened the galleries Aug. 6, redesigned for visitors to view and enjoy more of the museum’s collection of art from that continent. The year-long renovation began after the Carlos Museum's major exhibit on the impact of African cultural astronomy, "African Cosmos: Stellar Arts," closed last summer. The new space focuses on flexibility, enabling the staff to refresh the objects on exhibit and show more of the collection over time. 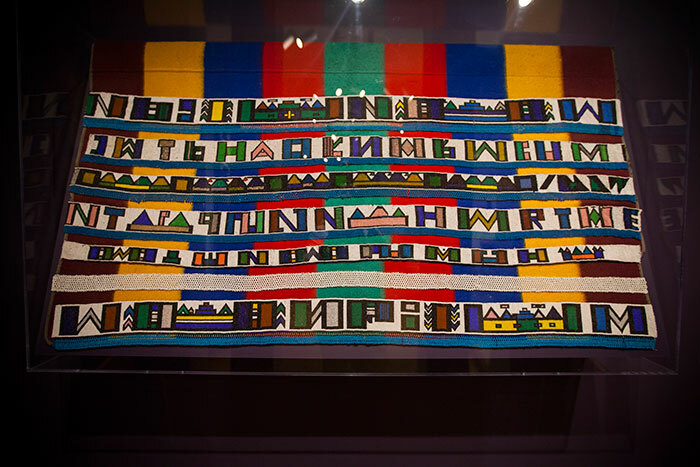 Less than five percent of the museum’s African collection can be displayed at any one time. “I think we opened up the space, which I hope will make it easier for groups to tour the gallery,” says Amanda Hellman, curator of African art, referencing the space on the museum's third level. When visitors walk up the stairs from the Egyptian galleries, they see the objects for the theme of Personal Use and Adornment. Other themes include Masks and Movement; Materiality; Christian, Islamic and Hindu Traditions; Power Figures; and Colonialism in Africa. Every section will have an iPad to add additional context to the displays, Hellman says. "Though the information will be basic at first, we will continue to add interviews, videos of performances, photographs, conservation efforts," she explains. Hellman’s favorite section among the iPad’s information groupings is conservation. “It shows the way issues are diagnosed and treated, and how we find out what materials make up, for example, Mami Wata’s coating, such as egg yolk and kaolin," she notes. The conservation section’s information about how the objects were used and different details to consider can prompt “you to look more closely at the object, seeing things you didn’t see before," she says. A “connections” section on the iPad will be able to link an object to temporary exhibitions that come to the museum and to programs and projects that are happening across campus and around the world, Hellman notes. 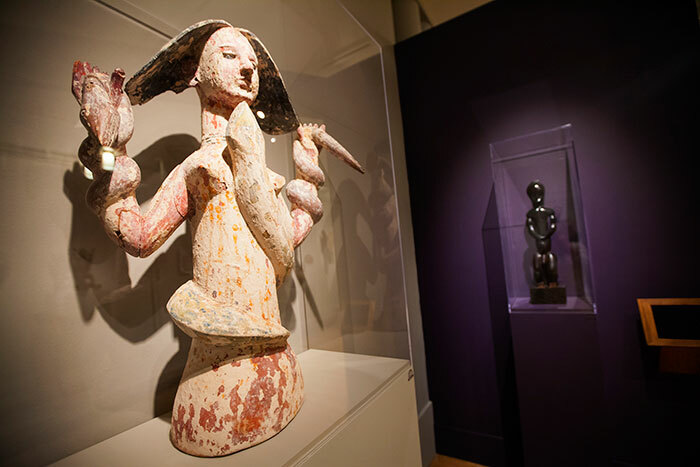 For example, with Mami Wata, there could be links to other figures in the collection related to female effigies or to new developments such as research turning up a new Mami Wata or new knowledge related to her. The iPads will be mounted on tablet stands made from Iroko, a hardwood from West Africa, “designed and produced in-house by our senior preparator Caleb Plattner,” Hellman says. "I think he did a wonderful job. [The tablet design] ties into the gallery well. 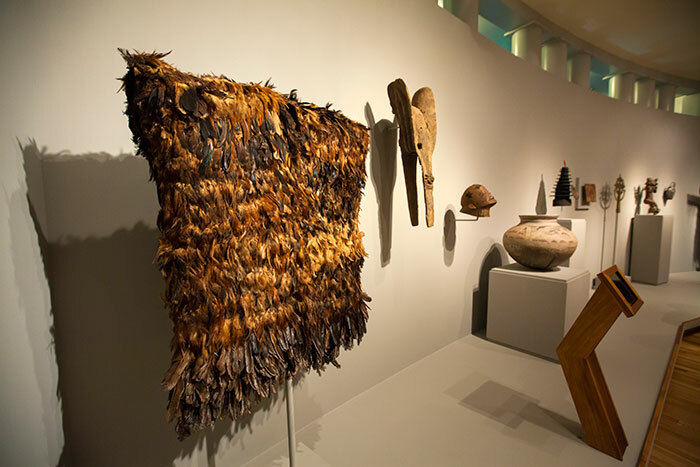 We added that detail elsewhere,” she says, pointing to an Iroko molding running along the divider between the floor and the exhibition area for the objects. “I think one of the ways the iPad will be useful is we will be able to show different sides and aspects of [an object] in detail,” Hellman says. As an example, she stands before those cattle horns on display, a set from Nguni cattle covered with scrimshaw-inscribed scenes of the Anglo-Zulu war of 1879. Hellman points out a man on a unicycle, a scene with a snake sent by the Zulu warriors over to the British soldiers, and the dozens and dozens of soldiers carved into this extraordinary piece. Moving to the 19th-century blue beaded bowl figure, Hellman describes the object as "one of the finest pieces in our collection." 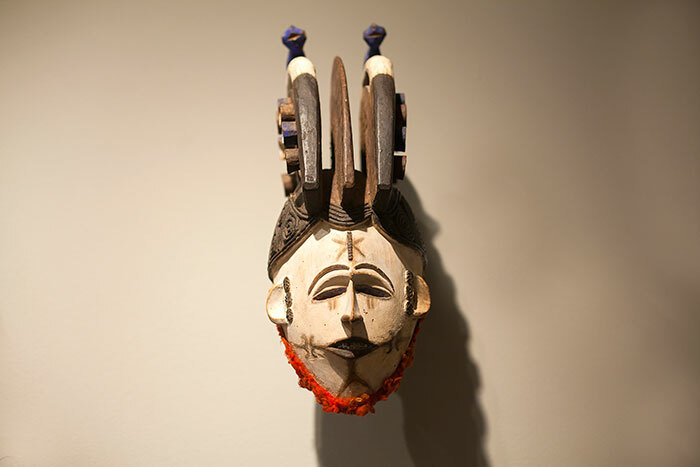 Among several new pieces in the redesigned galleries is a mask from Malawi purchased in June 2015. Pointing to the puppet of a colonial figure, Hellman says, “He was in the previous installation but I feel like he’s really come to life in this display. 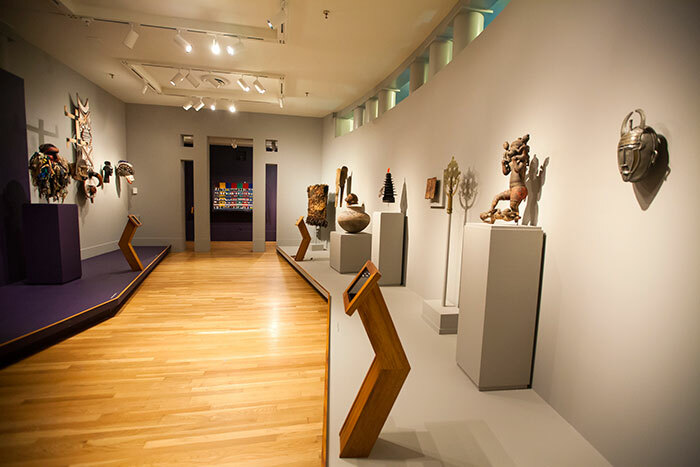 Museum admission is free for Emory faculty, staff and students. Visit the carlos.emory.edu for open hours and information on programs and other exhibitions.